- Arrive – toilet – line up – ready to walk up to the staircase and watch video. - After video session (10mins), children will go into the museum. The museum is a very small, short and narrow walkway , only 2 by 2 can walk along the walkway.There are some display of the history of chocolate. - After that, will come to the part where the production line start. It is still the same walkway. 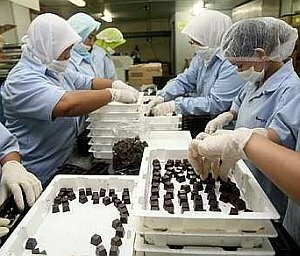 Children will see the production line from the glass and then finish up walking down a stairs and come back to the souvenir shop to taste a small pieces of chocolate. - Take group photos – enter the bus.